Macrosiphum tinctum apterae are mid to blue green with a darker spinal stripe (see first picture below), or less commonly pink-red (see second picture below). The antennal terminal process is.6-7.1 times the base of the sixth antennal segment. The fused last two segments of the rostrum (RIV+V) are 0.98-1.1 times longer than the second segment of the hind tarsus (cf. 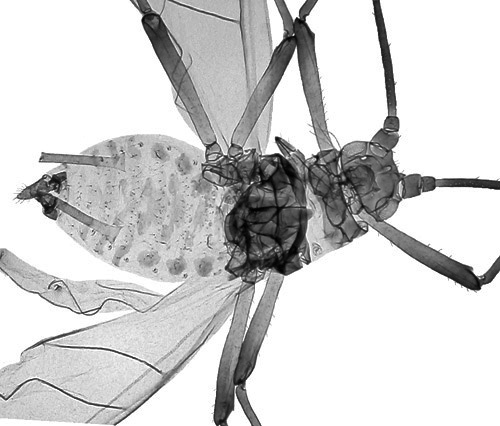 Macrosiphum euphorbiae in which (RIV+V) are 0.83-1.02 times longer than the second segment of the hind tarsus). 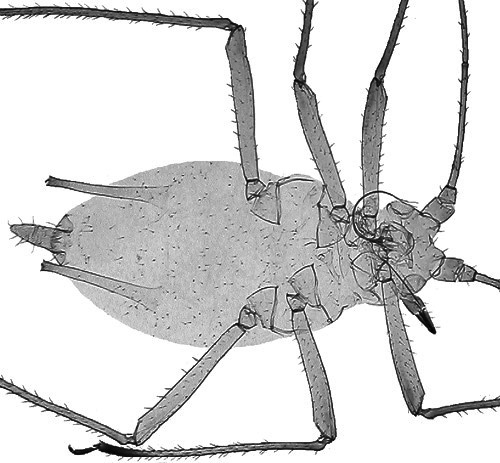 The femora of Macrosiphum tinctum are entirely pale. The dark apical sections of the tibiae are usually markedly swollen to 1.5 or more times their least diameter (cf. Macrosiphum euphorbiae which does not have the apical sections of the tibiae so swollen). The siphunculi are dusky at their apices and are 0.30-0.37 times the body length. The alate viviparous female (not pictured) has a green (or rarely red) abdomen and, as with the aptera, the dark apical sections of the tibiae are often markedly swollen. 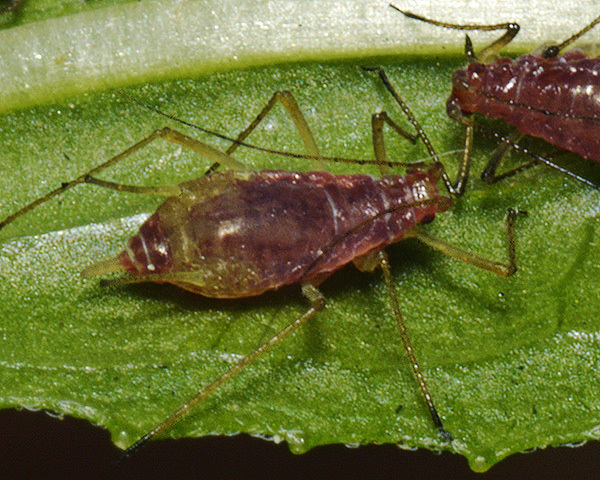 The clarified slide mounts below are of adult viviparous female Macrosiphum tinctum : wingless, and winged. 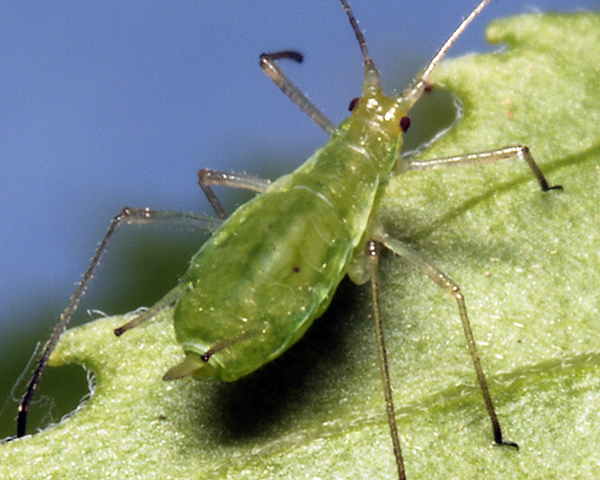 The green willowherb aphid does not host alternate. Macrosiphum tinctum is found on willowherbs (Epilobium species), mainly Epilobium angustifolium (rosebay willowherb) and Epilobium montanum (broad-leaved willowherb). Macrosiphum tinctum has been recorded from 8 Epilobium species. Blackman & Eastop list 22 species of aphid as feeding on rosebay willowherb (Epilobium angustifolium) worldwide, and provide formal identification keys. Of those aphid species, Baker (2015) lists 15 as occurring in Britain: Aphis epilobiaria, Aphis epilobii, Aphis fabae, Aphis frangulae, Aphis gossypii, Aphis grossulariae, Aphis mirifica, Aphis nasturtii, Aphis oenotherae, Aphis praeterita, Aphis salicariae, Macrosiphum euphorbiae, Macrosiphum rosae, Macrosiphum tinctum and Myzus persicae. Blackman & Eastop list 13 species of aphid as feeding on broad-leaved willowherb (Epilobium montanum) worldwide, and provide formal identification keys. Of those aphid species, Baker (2015) lists 11 as occurring in Britain: Aphis epilobiaria, Aphis epilobii, Aphis frangulae, Aphis grossulariae, Aphis oenotherae, Aphis praeterita, Brachycaudus cardui, Macrosiphum euphorbiae, Macrosiphum tinctum, Myzus lythri and Myzus ornatus.